The usual suspects to blame have long been identified: poor customer insight, the lack of executive leadership, the lack of innovation strategy, weak innovation culture–make you pick. Yet no one seems to ask a simple question: does the model of innovation described above work? 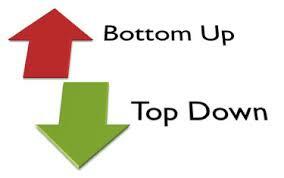 In organizations, innovation can flow in two major directions: bottom-up and top-down. In the bottom-up model, the one the XYZ Company has chosen, the focus of innovation is on ideas. The ideas are collected on the ground and then channeled up to the organization’s leadership. The popularity of this model is fueled by a widespread belief that innovation must harness a collective wisdom of the whole organization. Unfortunately, the bottom-up model has a number of serious flaws. First, employees, especially those at lower steps of the organizational ladder, usually have only a vague understanding of the strategic goals of the organization; consequently, their ideas are often completely misaligned with the organization’s real needs. Second, the burden of evaluating and implementing submitted ideas usually falls on business units that already have a full load of their own stuff. To make room for “newcomers,” business units have to kill their existing projects, and killing projects is not something organizations are good at. Third, in most large organizations R&D budgets for the next year are usually drafted no later than the Q3 of the prior year. That means that new projects receive no immediate funding and have to wait for at least a few months to get paid for, at which point their utility is often highly questionable (not to mention how detrimental this delay is to employee morale). One can go on with the criticism, but the bottom line is that for organizations with shorter history of innovation programs the bottom-up model of innovation doesn’t work. Is there a plausible alternative? Yes, it’s the top-down approach. In the top-down model of innovation, the focus is on problems. The organization’s leadership formulates problems that are crucial for the organization and then moves them down the ladder for employees to suggest solutions to these problems. The ways the problems are presented to the employees may vary and can include innovation jams, innovation contests or challenges posted to internal innovation networks. The benefits of this approach are numerous. First, for as long as the problem addresses an organization’s strategic need, submitted solutions will always “make sense,” regardless of whether they’re successful or not. Second, coming from the top of the organization, the proposed problem from the very beginning has its own executive sponsor whose responsibility is to ensure proper funding for effective solutions. Third, the organization remains in full control of the number of innovative initiatives it pursues: if it can afford multiple initiatives launched in parallel, fine; if it struggles with the lack of resources, single initiatives can be handled one at a time. Finally, giving specific feedback to the employees about the value of their solutions is much easier and productive than explaining to them why their ideas were ignored. Regardless of whether an employee “wins” or “loses” an innovation contest, he or she feels engaged and appreciated. No, I’m not saying that the bottom-up model of innovation has no right to exist. In mature organizations–where employees know what kind of innovation the organization needs; where a robust protocol for evaluating unsolicited ideas exists; where a special fund to pay for “spontaneous” projects is set aside–it can be remarkably successful. But if your organization is at the very beginning of a long, bumpy road to innovation glory, going top-down is the way to go. This entry was posted in Innovation and tagged Crowdsourcing, Innovation, innovation challenges, innovation contests, innovation jams, Innovation Management, internal innovation networks, Open Innovation, R&D processes. Bookmark the permalink. I think you need both, a top-down and a bottom up approach otherwise 3M would have never created the famous post it and Intel would have disappeared for a longtime with its RAM. In the INTEL case the employee at the bottom of the ladder saw the threat coming from Asian firms who were selling their RAM at a lower price. The same employee forecast the need for microprocessor and develop it, fortunately, “in the back” of the executive. . The employee who are getting their hand dirty can see market change and new costumer needs or feel that something is happening before the top executive. The difficulty for them is to realize if it is just noise or weak signal that need to be taken seriously. Thank you for your comment. As I said at the end of the post, it’s a matter of timing: for mature–innovation-wise–companies, both approaches work; however for “newcomers,” the bottom-up approach creates more problems that it can help solving. Besides, if in a company, top executives see market change later than the employees, this company is in BIG troubles, and not only in terms of innovation.